I live in an almost-100-year-old house. Except for the bathroom floor with the extravagant radiant floor heat. I shuffle around a lot. My partner does the day-after-Thanksgiving sales. Though early on in our relationship, you could find me wandering the aisles of Fred Meyer at 5:30 am the day after Thanksgiving. Because I now have a year's worth of socks. She has some new tools. And I have feet that look like Ewoks. Happy ho ho holidays people. My feet are always cold - even in Southern New Mexico. I "almost" bought some Ugg knockoffs (even though they are out of style) since they look so very toasty and warm! Cute! I can relate, I wear slippers in my old house year-round! Love those hex tiles, too! 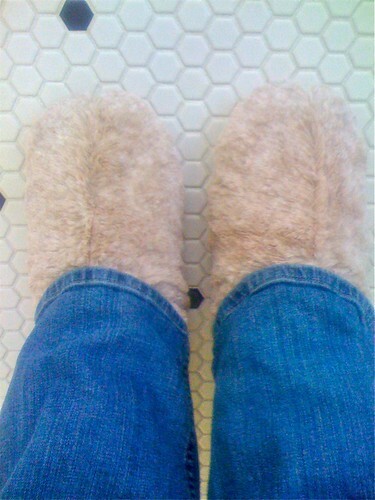 those ewoks look cozy...:) i love slippers of all kinds! wanted to mention that i just did the strawberry freezer jam with organic berries i had in the freezer. can't wait to taste it!! thanks for the constant inspiration! Do you wear those out in public?! You could, in Portland, you know. Hugs. I love those. I used to have bear feet.